Cummings said: “I’m honoured to be a part of this as it’s one of the biggest if not the biggest fight night Irish boxing will have ever seen. Maxwell said: “I consider myself very lucky to be part of these events. I’ve got to thank MTK Global and Frank Warren. I can’t wait to fight on another huge night in Belfast. TYSON FURY HAS vowed to abide by team orders and keep it strictly business when he turns to the second chapter of his comeback story against Francesco Pianeta in Belfast on August 18. The lineal world heavyweight champion took showboating to a new level in the first of his return bouts against Sefer Seferi at the Manchester Arena in June, first setting the mood for the evening by planting a smacker on the equally game for a laugh Albanian. 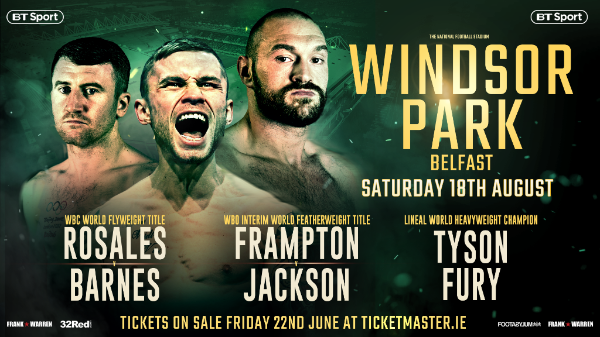 Tyson now reveals that, for his duel with former world title challenger Pianeta, his trainer Ben Davison wants him to have his serious head on and not play to the expected sell-out crowd at Windsor Park, which also plays host to Carl Frampton defending his WBO world interim featherweight title against Luke Jackson as well as the WBC world flyweight title challenge of Paddy Barnes to the champion Cristofer Rosales. “We saw the joker in the last camp, we saw the showman, the entertainer,” explained the 29-year-old. “Ben wants a serious approach this time and that is what he’ll get. “Everything is great, but if he wants me to be serious about this fight then I will be serious,” added Tyson, who reflected that he doesn’t have much of a track record when it comes to playing it straight. “I’m not serious about anything in my whole life, everything is like fun and games – even Klitschko. I wasn’t serious – I was doing all dance moves, everything. “But listen, if Ben wants serious, Ben will get serious. I’ll go in there and do my job and that’s it. Frank Warren echoes the thoughts of trainer Davison and the Hall of Fame promoter believes Tyson is more likely to stick to the script because of the more perilous nature of the assignment this time around. Also featuring in undercard combat is a cracking Belfast v Dublin clash between Steven Ward and Steve Collins Jr. Lewis Crocker, WBO European middleweight champion Luke Keeler and Marco McCullough are also in action. PADDY BARNES believes his place in Irish boxing history depends on the outcome of his make-or-break world title challenge next month. Barnes is one of his country’s greatest ever amateur boxers, but is willing to risk his reputation when he faces WBC flyweight champion Cristofer Rosales at Windsor Park, Belfast on Saturday August 18, live on BT Sport. The Irishman’s amateur stash includes bronze medals at the 2008 and 2012 Olympics, he struck gold at the Commonwealth games in 2010 and 2014, and was 2010 European amateur champion. But the 5ft 4in all-action star insists: “This is the night that defines my boxing career. “There were great achievements as an amateur including Olympic bronze medals, but that is only third place in the world which is great. “To be the best in the world at your weight, WBC world champion is definitely the one to win. “I did great as an amateur, and people will remember me for what I achieved but a world professional title is what I really want. “I ticked the boxes as an amateur and I want to do the same as a professional. Unbeaten Barnes, 31, will only be having his sixth professional fight when he challenges Nicaraguan Rosales (27-3) in front of more than 20,000 fans. No stone will be left unturned and Barnes has moved from the family home in Belfast to Glasgow for a training camp under Danny Vaughan ahead of the biggest night of his fighting life. He added: “Even now I am away from home preparing, but it makes no difference. When I was an amateur my training camps were in Dublin. Barnes is bringing in sparring partners from Mexico and the United States, after initial plans to spar with IBF featherweight champion Josh Warrington fell through. Warrington is lined up to face Windsor Park headline act, Carl Frampton later this year and Barnes says: “Josh would have been ideal sparring. “That would have been a great spar, but he is probably be a bit too heavy at the minute because he is a featherweight and will be weighing over that right now. WBO ‘interim’ featherweight champion Frampton faces Australian challenger Luke Jackson on the huge night of action on Hall of Fame promoter, Frank Warren’s show. Lineal heavyweight champion Tyson Fury is back for his second fight on the comeback trail and faces former two-time world title challenger Francesco Pianeta. Frampton acknowledges his challenger could be deemed something of an unknown quantity to fight fans in the Northern Hemisphere, but will in no way take victory on the night for granted. “He is and I think a lot of people will expect to just to beat him up and blow him away,” commented Belfast’s favourite fighting son. “But he is ranked No.4 by the WBO, he is an Olympian with a good pedigree and is undefeated. “So I will need to be ready and in the shape of my life. It is a big occasion with being at Windsor Park and that is the real thing here. I think that people who are coming to watch me perform at Windsor Park deserve for me to be in the shape of my life and put on a good show. “That is what I intend to do and then move on and hopefully fight for a world title before the end of the year. “I imagine some people will have been expecting a different opponent, but the fact I am not fighting a world champion is the fault of nobody. Josh Warrington beating Lee Selby sort of threw a spanner in the works for us because I think Selby would’ve come to Belfast. “Oscar Valdez is out injured, Gary Russell has just fought and Leo Santa Cruz and Abner Mares also just fought. That’s it really; the top guys just aren’t available. It is good for me to get a defence in here. “This is a dream for me and it is something I have talked about for a long time. You never know what happens in this game, it could be the one and only time I get to fight at Windsor Park. “It is going to be a special occasion for myself and my family. For the people who are going to come and watch it there is going to be a top quality undercard as well and I think it will be a night to remember for Belfast. 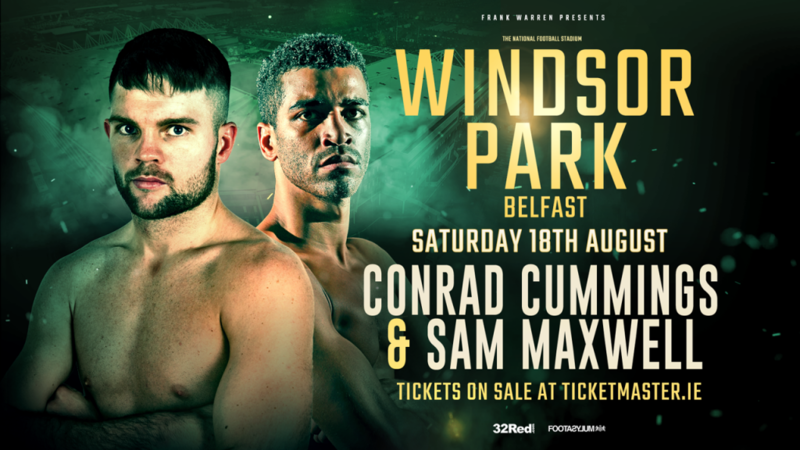 Hall of Fame promoter, Frank Warren, added: “We are delivering on a promise I made to Carl to ensure his dream of fighting at Windsor Park becomes a reality.